Taiya Peak is a beautiful mountain just 3.5 miles east of Chilkoot Pass. It is in British Columbia but you actually will park on the Klondike Highway between the US and Canada customs stations, since neither of them are right at the border at White Pass. 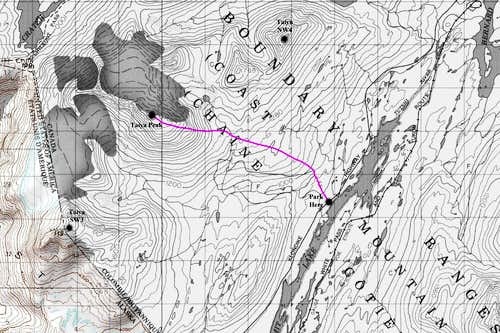 This makes for some interesting logistics if you climb this peak from Skagway, AK as you would pass the US customs on your way to the starting point, and enter Canada without "officially" entering Canada because you'd stop before Fraser, where their customs office is located. You would still need your passport though to reenter the US after your climb! The climb itself gains nearly 4,000 feet from where you would park to the summit with only minimal bushwhacking. It makes a great spring climb when most of the terrain is covered in snow, especially since the mountain itself isn't much more than a pile of scree! The views from the summit though are what makes this peak more than worth the effort as you can see well to the northwest and on a clear day, both Mount Logan and St. Elias are in view. There are also hundreds of other peaks, many of which are very rugged, visible both in SE Alaska and Canada. Since the Klondike Highway passes right below this peak it is one of the most accessible peaks in the region. The vast majority of mountains you will see from the summit of Taiya would be multiple day expeditions just to get to (except the ones just across the highway to the east). If you find yourself in the Skagway area this is well worth the trip. From Skagway, Alaska drive the Klondike Highway north to the international border at White Pass and measure from this point. Continue 3.3 miles into British Columbia and park at a large pullout on the right (southeast) side of the road just AFTER crossing over a small bridge at 2,950 feet. From Fraser at the Canadian customs office, drive 4.4 miles south on the Klondike Highway to this same pullout (which will then be on the left). Make sure you park on the NE side of the bridge so you don't have to cross this river on your ascent. From the pull out, where you will probably see tourists taking photos of Summit Lake, begin hiking due north over the rolling rocky terrain until you reach a short but steep 20 foot drop. Scramble down this and bushwhack through the willows off to the right (east) of the river. These willows are the worst of the bushwhacking on the route but if they are snow covered it will be much easier. Continue north, then slowly veer to the northwest trying to stay on the open rocky terrain, crossing through bushes when necessary. Once you hit about 3,400 feet, the bushes will really thin out and you will emerge on a very large open area of rock slabs. From here walk on a WNW bearing for about 1.3 miles, crossing two deep gullies along the route (one at ~0.6 mile and one at ~1.2 miles). These gullies will require you to route-find a class 2 or 3 route down in and back out of, since they are guarded by 50 foot cliffs in many places. Simply find a break in the cliffs and cross through them. After crossing the second major gully, head due west and ascend the slopes, staying south of the rugged, more cliffed east face. The steepest and loosest area is from about 5,200 - 5,500 feet where great care should be taken to avoid knocking rocks down. Ideally this will be snow covered. Beyond this you can stay more or less near the east ridge and continue west up more solid rock. At 6,300 feet the angle of the slope mellows out significantly and the final 500 feet is an easy walk for 0.4 mile to the summit at the far NW end of this summit plateau. This part of the route will certainly hold snow later into the season, but it isn't steep enough to need an ice axe. Only the slopes between 4,300 - 6,300 feet would require an ice axe as the steepest angle of ascent is around 40-45 degrees. From the summit enjoy the glorious views in every direction. If you are lucky you should see Mount Logan and St. Elias way off to the northwest. Mount Carmack is the very prominent peak to the south, and further off to the southeast you'll see hundreds of ice clad peaks, many of which probably remain unclimbed. On your descent simply retrace your steps. The south face also is a viable route but this would require more bushwhacking closer to the river before heading up the south side of the mountain. Utilizing the rocky terrain further north especially in summer makes for a more enjoyable trip. In winter or spring it really wouldn't matter. Just have your passport with you so you can return to Skagway after the climb (if you are coming from Alaska). Do not tell the border patrol people anything. If you are coming from Canada and want to return to Canada afterwards (even though you technically wouldn't have left Canada!) bring your passport as well. There is not really any reason to camp on this peak as it's a very doable day climb. Any time if year would be feasible. Winter and spring ascents would make for good ski runs. If you are climbing in summer, be prepared for a bit more (but very manageable) bushwhacking, and more loose rock. If you look to the NE from the summit of Taiya Peak, about 5.8 miles away is a tall beer bottle shaped black tower at least 100 feet tall. Looking into it on Google Earth, I can only assume it's an alien invasion...or the Canadians just have some strange ways of making radio towers! This tower can also be seen from the Klondike highway where you park for Taiya Peak.